Encouraging Word: RUN With Endurance! I felt like the Lord wanted me to encourage you tonight before we get started with our series about healing from rejection and abandonment tomorrow. 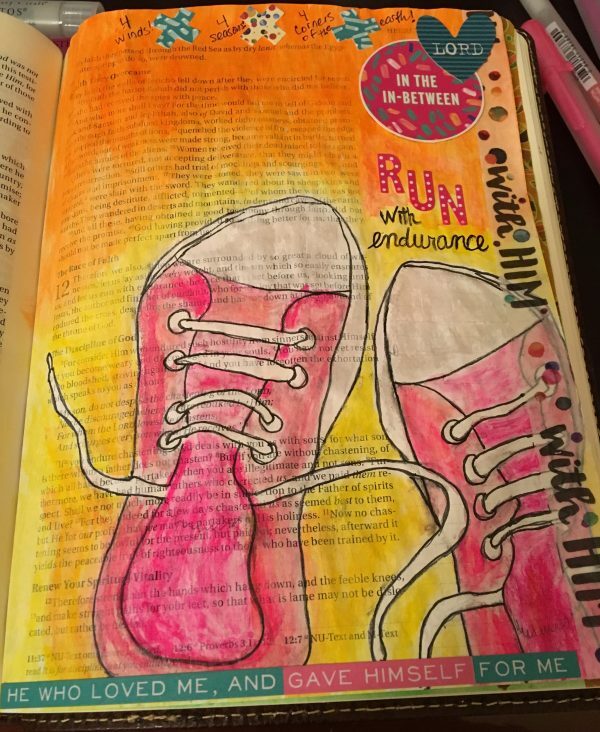 I’ve been Bible journaling again with my Illustrated Faith Goals with Grace kit from DaySpring–which I still love, by the way–and I have had Hebrews 12:1-3 on my mind, so I’ve been meditating on that passage. 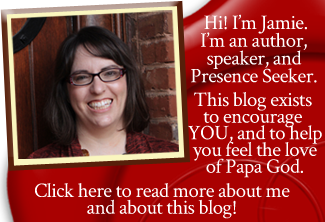 Related: Read about my encounter with the Holy Spirit using the Goals With Grace kit here, and check out all the materials in Goals With Grace here. I love this kit and highly encourage you to order yourself one from DaySpring online if you can! For consider Him who endured such hostility from sinners against Himself, lest you become weary and discouraged in your souls” (Hebrews 12:1-3). Remember all the things your Father God has brought you through. Remember all the times He didn’t abandon you, when you were afraid He would (but He never did, never has, and never will). Remember how much mercy He has shown you, loving you and caring for you when you didn’t deserve to be loved or cared for–and know that He never begrudged you one moment of that love. He’s just that wildly in love with you. Remember how great a love Jesus showed for you, for He laid down His life for you. Beloved, if you’re discouraged tonight, REMEMBER. Remember. You’ve come too far too look back to go back, but it does the soul good to think about all the ways Father has always been there for you; has always helped you; and always been faithful to you. Remember, and give thanks. It will build your faith. As you’re looking back at all the times the Lord has delivered you, bring back to mind how, each time when things looked darkest, it was always just before dawn. Beloved, no matter what you’re going through tonight, the same principle is true. It’s darkest right before dawn. And even when we can’t see God working, He is working in your life anyway. Father God is not intimidated by your circumstances. He has never been bowled over with shock or surprise. Men’s faithlessness has never overwhelmed him. Neither lack, nor want, nor hurt have ever astounded Him. He’s right where He always is, sitting on His throne–and His hand is not shortened, that it cannot save. His ear is not dull that it cannot hear. Precious Presence seeker, our Father God works everything out for your good and for my good if we love Him and are called according to His purpose. His ways are not our ways, and His thoughts are not our thoughts. Nevertheless, beloved, understand that Father sees, and Father knows, and Papa’s got it all under control. Rest in that knowledge. Snuggle up on His lap with your teddy bear and trust Him. Let Father work, and you just find safety under the shadow of His wings. Beloved, Father God is NEVER going to let you down. In order to let you down, He would actually have to get off His throne and cease being God, which is not possible. Why? Because His Word says that He will never fail you, never leave you alone, never leave you without support. And God is not a man, that He should lie. Never done for; never down for the count; never a lost cause. Never beyond the reach of Father’s ear, even with our slightest whisper. Oh dear child of God, Father loves you. And He told me to tell you tonight that He is going to prove Himself faithful to you, whether you feel like He is or not. So RUN. Remember. Understand. Know that He will NEVER leave you or forsake you. And set your eyes and keep them set things above, where Christ is, seated at the right hand of God. Lift up your eyes, church, for your redemption draws near. Lift up your eyes to Jesus, the Author and the Finisher of your faith. Lay aside every weight, and the sin that so easily besets us–the sins of doubt, unbelief, unforgiveness, and anything else–and run with endurance the race that is set before you. Father will prove Himself faithful, and He is worth the cost. Does this word speak to your heart today? If so, please leave a comment below, and please encourage your fellow readers too! I really noticed Hebrews 12:3, He really did get hostility from sinners and the religious. I will not give up Jesus ! I will endure till the end. Thank you for never leaving me and always loving me and always helping me. Thank you so much for that word of encouragement. I really needed affirmation, I’ve been discouraged, deeply sad recently and your email has uplifted n given me the comfort I needed. Thank you soooo much. I appreciate it more than u will ever know. Much love and God bless you! and keep you favored, protected, and guided always! Really looking forward to your post tomorrow! Dear Jamie, thank you for these words. I am blessed with them. Such soothing and words of encouragement. Yes I have to RUN to achieve my goal. Jesus is the finisher and I have to look up to Him to help me with the race. God bless you, Jamie. Oh Millie. Thank you so much for letting me know. I praise God for blessing you and comforting you. It’s all Jesus, I assure you! <3 Thank you for reading and I pray our Father would continue to lift you up and strengthen you in all things. In Jesus' name. What a powerful word! Thank you for your faithfulness in sharing. I can’t say in any better than Connie’s comment. I can only agree. Hallelujah to my loving faith full Father who never has, and never will let me down. Praise You Jesus !